We got emails and phone calls last week notifying us that there was a quantity inadvertently omitted in the print version of my rosemary honey mustard chicken recipe. If you saved that recipe to make at a later date, you might want to grab a pen and write in 3 next to "tablespoons honey." Your tastebuds will thank you. Speaking of things that are missing, it's late July and my freezer holds no salmon. My kitchen also has yet to see a 2018 sockeye or silver. The salmon runs this year have been peculiar at best; there are high levels of bacteria on Kenai beaches and the effects are widespread, hitting close to home. When salmon is less than plentiful or the fishing conditions are less than desirable, other Alaska seafood can step in to fill the void. Rockfish, cod and flounder, for example, are highly adaptable can easily be swapped into many recipes. These options typically cook very quickly, so just adjust your cooking times according to the thickness of the fillets. Fortunately, I have some rockfish in my freezer. Rockfish makes a pretty damn perfect fish and chips or a classic Baja fish taco. I was craving a big bowl of freshness, so I made fish taco bowls, where all the summery fish taco flavors can be packed in and enjoyed with a fork. The trick to a delicious bowl is seasoning every layer individually, which helps every layer shine and come together cohesively. No one wants a bland bowl. I used a mango salsa because I had ripe mangoes on hand, but you could easily substitute peaches or pineapple for the mangoes, or swap it out completely for a red salsa or pico de gallo. Somehow this dinner made me momentarily forget about the salmon situation. In a small bowl, whisk together the sour cream, lime juice, milk, garlic powder, and Tapatio until smooth. Season generously with salt and pepper to taste. The dressing should be thin enough to drizzle. Cover and refrigerate until ready to use. In a medium bowl, stir together the mangoes, bell peppers, red onion, cilantro, lime juice and salt. Cover and refrigerate until ready to use. Heat the oil in a non-stick skillet over medium high heat. In a small bowl, stir together the chili powder, cumin, garlic powder, and salt. Pat the fillets dry and season generously with the seasoning mixture on both sides. Cook the fish in the pan, until browned on both sides and cooked through in the center, about 2-3 minutes per side. Remove from heat and set aside. Season with more salt if needed. In a large shallow bowl, layer the cabbage, quinoa or rice (if using), black beans, tortilla chips, and salad greens (if using). Top with a rockfish fillet and avocado slices. 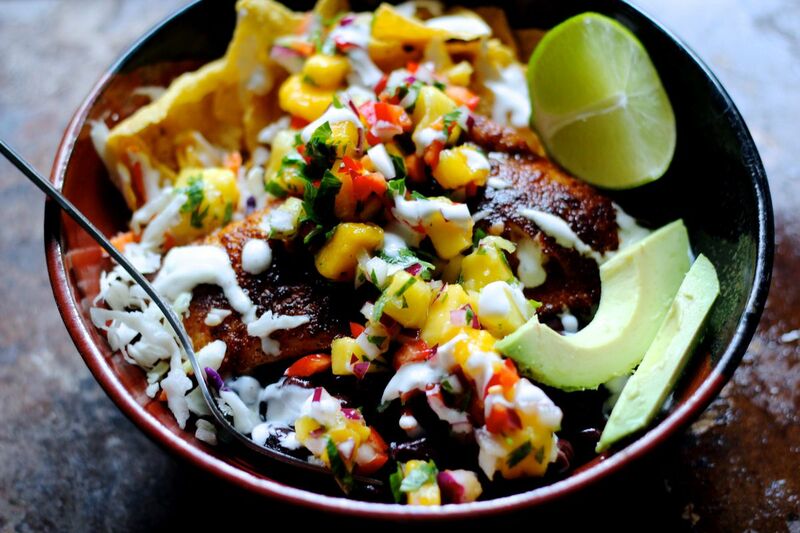 Spread a generous amount of mango salsa over top of the fillet. Drizzle everything generously with dressing.